Durable, Light Weight and Portable! Terrific Price for This Book Sales Item! 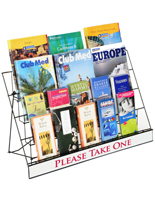 This book rack fits lots of products and sizes into a limited space! 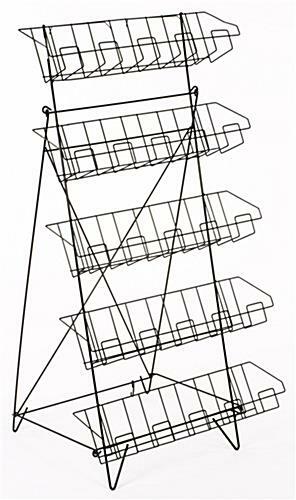 Made of a light weight, durable wire frame, this stand has an appealing open shelf design for easy browsing. 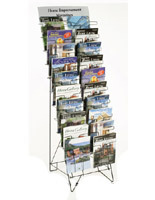 This book rack, display rack, holds books, CD's, DVDs, brochures, greeting cards, you name it! 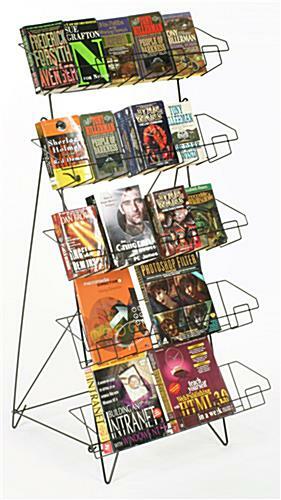 This book rack, also known as a wire rack, has 5 open shelves with 20" wide pockets. 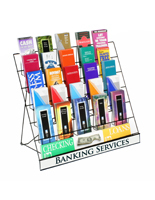 This book rack has a durable, powder coated finish and is painted gloss black. The stand looks terrific and matches almost any room décor. 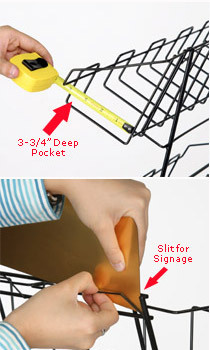 At the back of the stand, there is a slide for inserting your additional sign on top (not included). The Books of the Month header is pictured as an example of what your custom sign might look like. 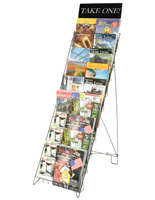 This book stand is portable and can be folded up for easy storage. 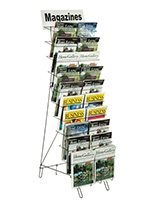 This book rack is a quick set-up product. 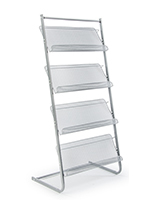 22.5" x 44.5" x 24.0"
20.0" x 5.3" x 3.8"
20.5" x 5.0" x 0.03"
I sell books and these work well for smaller chapter books. I wouldn't suggest using these for heavier items and the back support isn't very sturdy for heavy items. But overall it serves its purpose for what I need it for. Thank you for the great review, Stephanie! 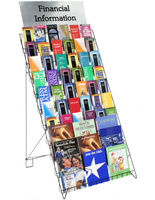 We're glad that this tiered book rack worked well for putting your chapter books on display. 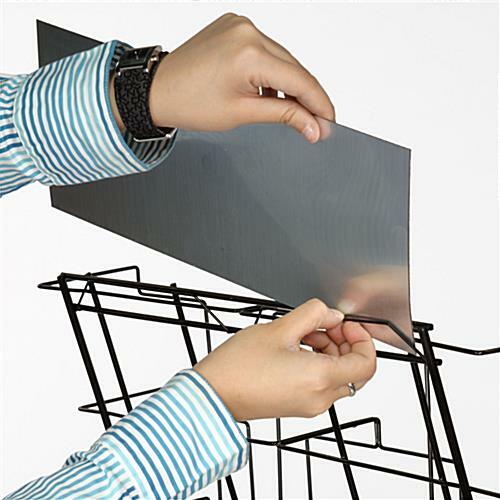 We appreciate your feedback regarding the sturdiness of the rack, and we'll forward it along to our product team for review. Thank you again! 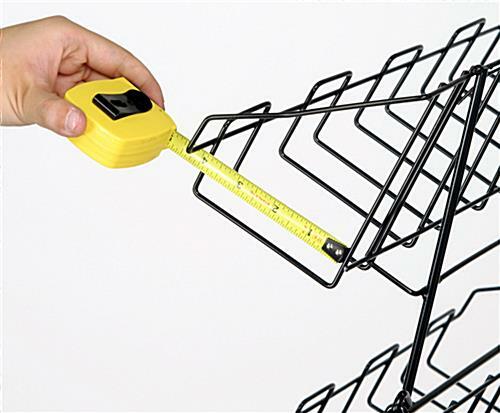 Website photos of racks ordered do not accurately present to have the size of literature the photo displays. We are going to return the items. We will order another product from them only if they handle the return of the product received without any cost incurred. Clearly, their associates do not know customer service. Hi Jim, One of our customer care specialists will reach out to see how we can help. Thanks! I'm a book lady and ordered these to hold all the chapter books and smaller books that I was having trouble displaying. I love that they fold flat for traveling as I set up all over the state for events and bookfairs. They came packaged well and showed no damage. I'll be testing them out next week, but I have no doubt they will be just what I needed. Thanks for the review, Jessica. When you do try it out, feel free to share a photo of it in use on our Facebook wall! We love it when our customers show off their products "in action!" This floor stand does the job so well. I absolutely love the way my customers can see my books displayed here. Two Thumbs Up! I hesitated on buying this for awhile. Now that I have it - I wish I had had it much sooner! It's very versatile and sturdy!